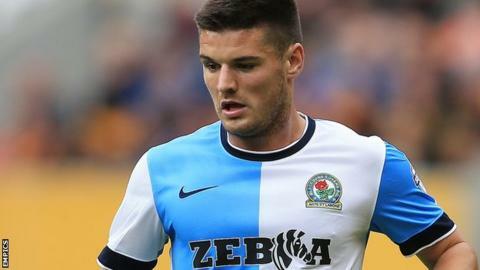 Blackburn Rovers manager Gary Bowyer believes winger Ben Marshall is one of the best players in the Championship at the moment. Marshall, 23, set up Rovers' first goal and scored a free-kick as they beat Reading 3-1 to move up to seventh. Asked if there is a player in the Championship better than Marshall right now, Bowyer responded: "It would be very difficult to find one that is." The former Leicester winger has scored three goals in his last four games. "We've got to keep demanding more from him," Bowyer told BBC Radio Lancashire. "Sometimes the goalkeepers get fed up with him [in training] and go in and just leave him on his own." "I thought his defending was excellent in the second half and going forward I think he's displayed everything. "He can cross it, cut in on his inside - the third goal where he runs at him and goes on the outside, the defender doesn't know where he is going. "His free-kick is magnificent. He's last off the training pitch practicing the same sort of angle, so it doesn't surprise me as he works ever so hard at it." Marshall, who has now scored five goals this term, spent time in the youth academies at Manchester United and Crewe before his move to Stoke in 2009. He then joined Leicester for a reported fee of £1m, but moved to Ewood Park last summer on a four-year deal after falling out of favour at the Foxes. "Sometimes the goalkeepers get fed up with him [in training] and go in and just leave him on his own," added Bowyer. "He's just got to keep working hard now and getting better. There is no reason why he shouldn't get double figures now."